I feel like I'm tempting fate sticking this up now but I guess it might be useful for people if they knew who was speaking when. I should emphasise however that this is just a rough list, subject to, and likely to change. I made the mistake of asking all the speakers when they'd like to go on and they almost all said 'early, but not first'. That of course is not possible so if anyone's really upset with their slot please let me know and we'll negotiate. It is also entirely possible that I've forgotten someone. If you think you're speaking and you're not on this list please let me know. 4.30ish - end, pub etc. Is that Ken Morse the rostrum cameraman? Ah, Collyn is speaking. Cool. Oops. Sorry. I knew I'd do something like that. It's not Ken Morse, it's Ken Hollings. Agh. Sorry Ken. Now corrected. i also loved that from matt dent to andrew walkingshaw in 4 easy moves! genius..
i hope it is all a breeze! I recognize Interesting isn't a "business" event per se, but I must say it's refreshing to see a speakers line up that doesn't feature the same eight people time after time (even if they are good). Wish I was in London because I'm sure this will be a great time. Yes. Matt Dent, Matt Webb, Andrew Webb, Andrew Walkingshaw is very good. Really excellent - so many high spots. Brilliant! I had a great time, thanks. A worthwhile Saturday indeed, im full of thoughts, excellent presentations. Here are some pics I took during the day. I wasn't aware of this! I've only just found out about it. 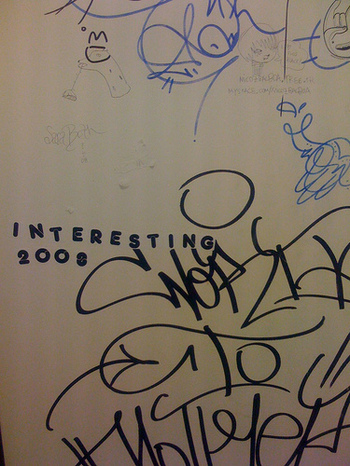 I hope there's an Interesting 2009, because I'll be there!